Good evening. I would like to make known that my friend and I were scammed by a man Jared Ang Hsien Loong. We really need the help of everyone to spread the news and find out the whereabouts of this person so that we are able to recover our losses and bring the scammer to justice so he doesn’t go around scamming others. On the 15th of July 4pm a man sold us a Fake Replica Audemars Piguet. 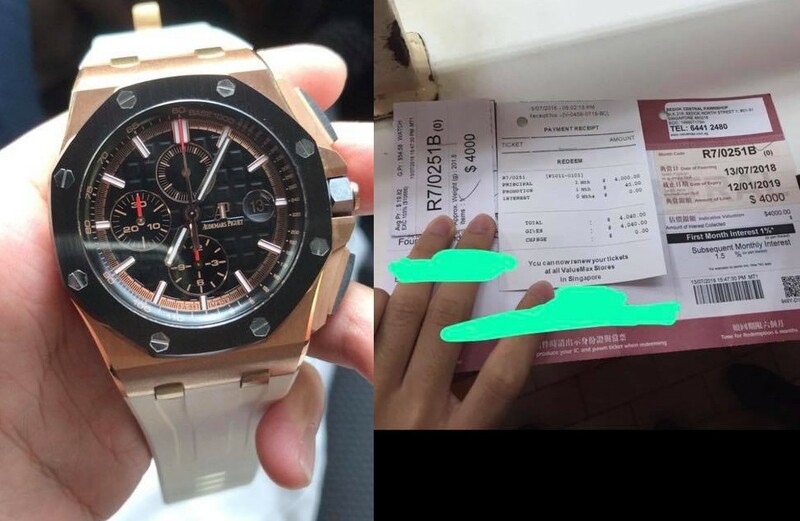 On 15th July, a man(Jared Ang Hsien Loong) attempted to sell me a ValueMax Audemars Piguet (AP) watch pawn ticket valued at $4000 via Carousell, stating that his grandma was in hospital and in urgent need of cash. That afternoon we met outside the pawnshop and was called in by one of the pawnshop staff standing outside. It felt like the pawnshop worker already knew the guy,Jared(Scammer). So I went in with Jared and we each paid $2000 to redeem the watch out. I agreed to pay Jared(Scammer) another $13,000 for the watch upon redemption because he said that I can give him the rest of the money when he gives me the box and papers. While my friend and I were checking the watch, he rushed us and told us that his grandma is in hospital and he needed to rush off as this could be the last time he sees her. So I quickly handed him the money ($13,000) as I thought I didn’t want to take up too much of his time and plus the watch was taken out of a reputable pawnshop, ValueMax Bedok 218 Outlet, so it should not be a fake. After the deal, my friend and I took a closer look at the watch movement. Soon to realise the quality of the watch is not the same as the authentic one. I then called up Top Hour Uncle Keson Lim and sought help from him. His shop was closed on that day but he was very nice to let me go down to his house to do the verification because I’ve known him for very long. He told me this watch is 100% fake. I am very thankful for his help on that day. We have already contacted the police with regards to this case and we hope to seek help from from anyone who knows this guy who sold us the watch to ask him to return the money. One thing I’d also like to bring up is that why did ValueMax take in the watch knowing that it’s a replica fake watch? And why did ValueMax, knowing that this is already a fake AP, not call the police to arrest the guy who pawned it. But instead ValueMax workers called him back to redeem the watch? What are the chances of pawnshop taking in fake watches given that their staff are so well trained. There’s really a possibility that the workers in the pawnshop are in working together with this guy who pawned the watch as when we visited the pawnshop on the following day 16th July the guy(Jared) would message us to tell us not to go to the pawnshop and it has nothing to do with them. How does Jared even know that we are in the pawnshop when he wasn’t even there? Did someone from the pawnshop keep in touch with him? Thank you for reading and below are the relevant pictures with regards to this case. We sincerely hope that this will come to an end and this Scammer will be brought to justice. We are really very disturbed by this incident. Nowadays things that come out from such a reputable pawnshop(ValueMax) also is fake. Please share this piece of news and don’t let the scammer scam others already. $15,000 is a large sum to my friend and I as we are still students, not from rich background and not earning much money.